RTC Business Park is one of the principal engineering employment centres in Derby with direct access to the A6 and is close to the railway station and city centre. The buildings sit in landscaped grounds. The owners, LCR, in conjunction with Derby City Council using their allocation of the Government’s Regional Growth Fund are investing in RTC to create economic growth, sustainable employment and rebalance the economy. 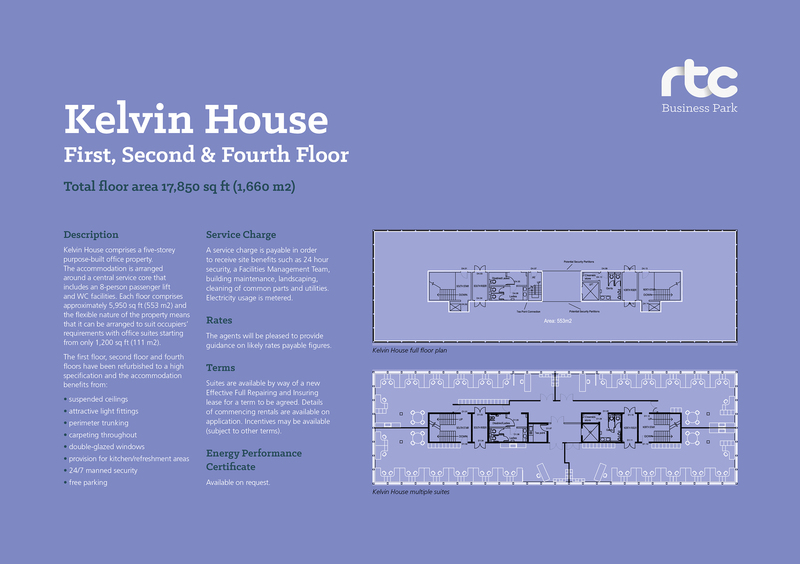 The whole of the second floor has been transformed to create approximately 23,850 sq ft (2,216 m2) of high specification office space. 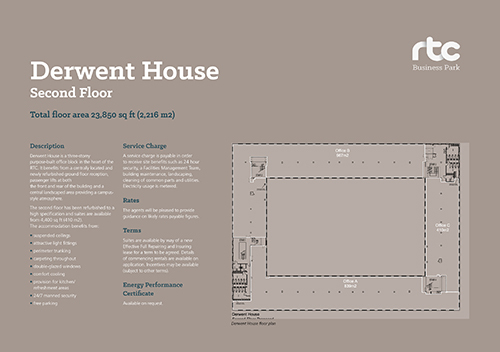 The works utilise the building’s wide floor plate and produces office suites from 4,400 sq ft (410 m2). The specification includes comfort cooling, high grade lighting, carpeting and double-glazed windows as standard. The property also benefits from a refurbished reception, providing a modern, light and spacious environment for tenants and visitors to enter the building. In addition, a walkway leads through a central courtyard to the rear of the building and to a new passenger lift. 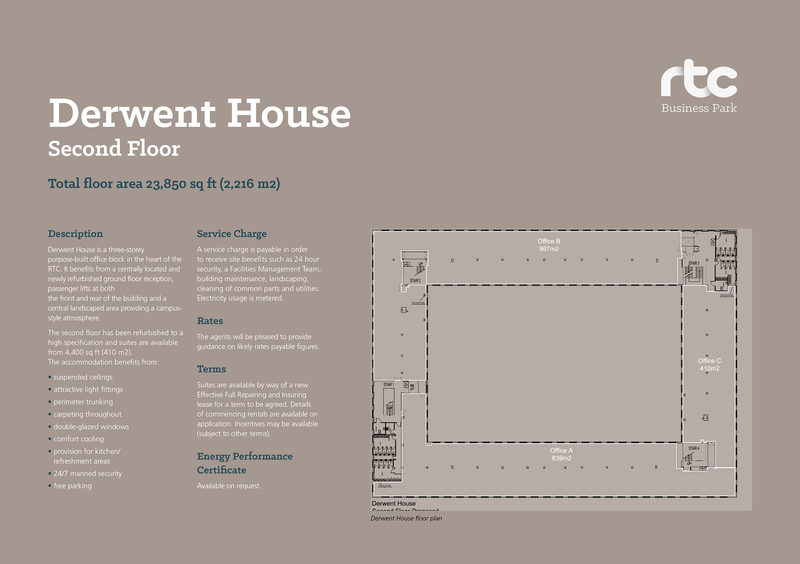 This increases the efficiency and ease of movement for tenants around the building. 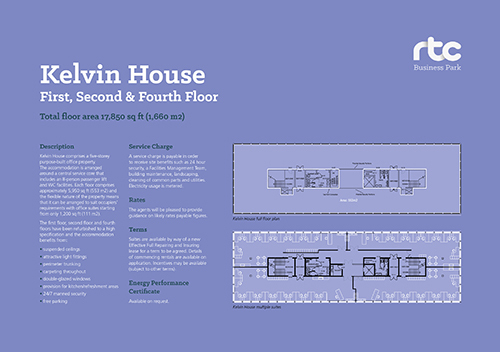 The first, second and fourth floors of the building have been refurbished, creating approximately 17,850 sq ft (1,660 m2) of high quality office accommodation. Each floor has a floor plate of approximately 6,000 sq ft (557 m2) but is capable of being split into four separate suites and there are multiple arrangements to choose from. Office suites are therefore available from only 1,200 sq ft (111 m2).